The CircuitWerkes Silence Sentinal ushers in a new era of analog audio monitoring. An internal Web server lets you monitor your audio from any Web browser, anywhere in the world. Automatically detects silence or overload on one, or both channels. Need to remotely control something? The Silence Sentinal gives you Web control of six relays (two are DPDT) that can be latching or momentary. Two status inputs give a visual indication, via the Webserver, whenever grounded & can also trigger automated relay actions. Use the Silence Sentinal anywhere that you need an inexpensive, network adressable, controller with status capabilities. Three levels of user control are available ranging from reader up to administrator. When silence, overload, or external status change, is detected, the Silence Sentinal can perform user-programmed, automated, sequences of actions and can also respond to user control via the network or via external contact closure inputs. Actions can be programmed to run once or to repeat while the condition exists. Alternate actions (or cancellation of previous actions) can be set to run when the audio returns to normal. Up to two Silence Sentinals can be optionally rack mounted in a single sized rack shelf. Administrators can perform all setup through the Web server. The Silence Sentinal includes free multi-site monitoring monitoring software. 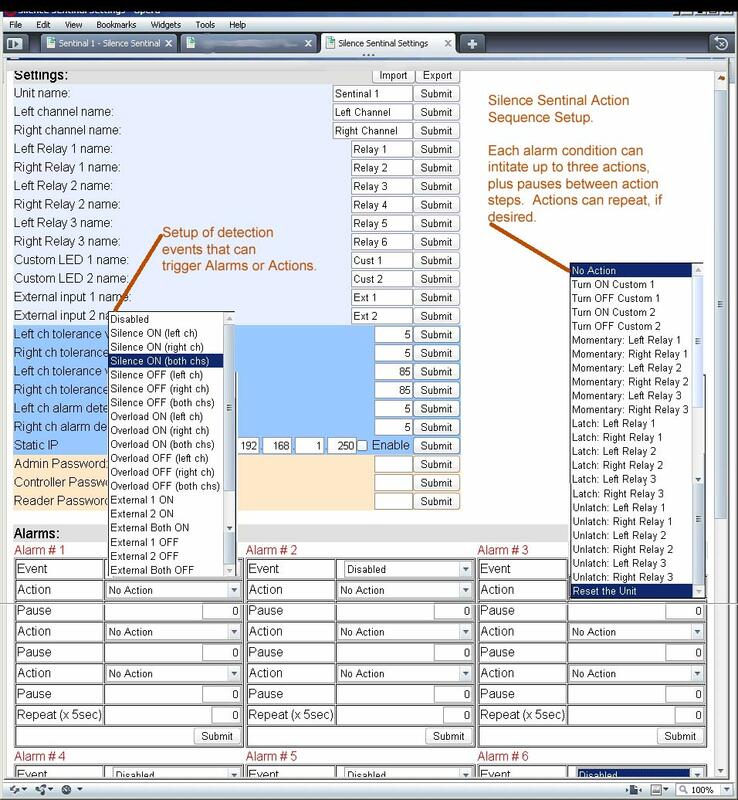 User settings & labels can be saved to the host computer and uploaded to the original Silence Sentinal, or to others for mass programming. Winner of the 2009 Radio World Newspaper's "Cool Stuff" award. Above: The main operating screen for the Silence Sentinal with low volume detected (red meter backgrounds).